When you want your kiosk project done right the first time, it’s time to hire the kiosk development experts. Our experienced team of kiosk software developers have the expertise to design great performing kiosk software that’s a pleasure to use. Already have developers and just want some guidance on how best to develop your kiosk software? Our expert kiosk consultants are ready to hold your hand from design to deployment. Please check out our kiosk consulting process. Once we know the best path for your unique business needs we begin gathering your initial requirements. In our initial phone call our goal is to determine if our services are a good fit for your unique needs. We start by asking a series of questions that help us better understand your kiosk project requirements. Why are these questions so important to answer? Simply put, there’s no point in wasting your time or ours if we can’t deliver the project when you need it and within your budget. For the time frame we’ll need to know when you want to deploy your first kiosks (typically a pilot) and how soon you would like to begin working together on your project. Keep in mind most kiosks (the physical hardware) have a lead time of about 2 months. Regarding the kiosk budget, we always like to set our clients expectations early on about how much a custom kiosk application really costs. After the initial call our expert kiosk designers will complete a ballpark range estimate and time frame for your project. The kiosk project cost typically falls into a few different tiers. We’re happy to make recommendations to the feature-set to help keep the project within your budget. If you’re happy with our recommendations then we’ll move forward with creating a detailed kiosk design proposal. Creating a detailed design takes time, so there is charge for the design proposal. Just as you wouldn’t build a custom home without a blueprint, custom kiosk software also requires a detailed blueprint. 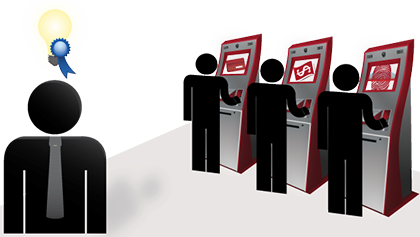 Your detailed design acts as the blueprint for your kiosk software so you know exactly what you’re getting. Changing a design is much quicker than changing your code, so the design phase is just one more way we help ensure the best use of your resources. Upon acceptance of the design proposal and receiving your initial deposit we can begin work on your project! The kiosk software development is the longest phase of your project because it’s where we transform your design into a functioning kiosk application. In many cases we’ll also create a centralized web portal for administration and reporting. Prior to releasing your kiosk software to a production environment you’ll have the opportunity test drive your application and ensure it meets all of your expectations. We’ll also perform quality assurance testing to ensure your kiosk will perform well for your users. We’ll prepare your kiosk software for launch, handling all of the necessary work to get your application onto your server. Deployment and configuration of your kiosk software can be performed independently or by our experienced kiosk software developers. In order to save on costs, we’ll train your staff to configure and deploy your new kiosks internally. Our kiosk software developers will remain available to resolve any post-deployment issues that might arise including software defects. Post deployment maintenance and support is an included service for the initial 30 days after deployment. Ongoing maintenance and technical support services are also available for an additional cost. Serious about moving forward with your kiosk project? Checkout this article on How Much Does it Cost to Build Custom Kiosk Software. Contact us today to learn more about our kiosk software development services and help ensure your kiosk gets built right the first time.